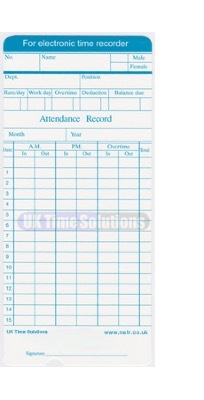 UK Time Solutions stock one of the widest selections of clocking in cards, replacement ink print cassettes and time recording accessories to compliment most makes & models of staff attendance time recorders and staff clocking in machines. We provide a range of consumable items including timecards including weekly time cards, monthly clocking cards and barcoded Seiko time cards, job sheets, time & attendance time cards, technician job timing tickets. As well as supplying stock cards we can also offer a service to specially print cards to comply with your own specification and individual requirements and designs.